Liberal Party Deputy Chairwoman Selina Chow has resigned from her position on the Executive Council after joining party Chairman James Tien in resigning from their party positions. Their resignations came after the poor performance by the Liberal Party in the LegCo election Sunday. The two candidates lost the LegCo seats that they had held for at least 25 years. The campaigning for Chow in the New Territories' West constituency had long been critical, with Chow saying she was in trouble when canvassing for votes, but Tien was unaware of his precarious situation until the vote counting started at midnight. The chief of the party dominated by businessmen looked disappointed when he realized that he wouldn't be able to maintain his seat in the New Territories East constituency with 28,875 votes, much fewer than the 68,560 votes he obtained in 2004. The voting results for the remaining constituencies were also bad news for the party. Not only had Chow lost her seat with 21,570 votes, but James Tien's brother, Michael Tien, failed to secure a seat in Kowloon West with only 13,011 votes. And party member Lam Chui-lin, contesting in Hong Kong Island, got only 2,166 votes. The total number of votes obtained by all of the party's geographical constituencies' candidates was fewer than those obtained by James Tien alone four years ago. Party member Joseph Tung, executive director of the Travel Industry Council, was defeated by Paul Tse by only nine votes in the tourism constituency. The number of Liberal Party seats in the LegCo will be reduced to seven from the existing 10. "I am extremely disappointed," James Tien said. "I have decided to resign as the party chairman to take responsibility for the failure in this election." In resigning as the party's deputy chairwoman and as a member of the Executive Council, Chow said: "I have given the Chief Executive my resignation letter. I entered the ExCo as a directly elected legislator and representative of the Liberal Party. I have to reflect public opinion to the government. I am defeated now, and someone should replace me". Chief Executive Donald Tsang said he received Chow's resignation and plans to make a replacement decision based on the existing political situation. Party chief Tien said he will not join the party's central committee, but he may take an advisory position. The party's other deputy chairwoman, Miriam Lau, who was able to retain her seat in the transport constituency, will be take over as the party chairwoman until a new party head is elected in October. Tien feared that businessmen might be discouraged to take part in direct elections with the party's defeat. But he added that the party will continue to support businessmen joining in the direct election. 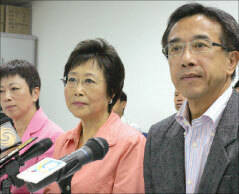 Lau said the party will review the reasons for losing the election and how the party can get more support. The drop in the voter-turnout rate, from 55.64 percent in 2004 to about 45 percent Sunday, did take a toll on the party, Chow said. "Our supporters are usually moderate and not politically sensitive," she said. "They don't have a high incentive to cast votes. And some of them are disappointed with Hong Kong's election culture after seeing the candidates arguing without rationale in election forums." Chow had been a legislator since 1981, two years before James Tien took up his position. "I am glad to have been a legislator over the past 27 years," Chow said. "I have witnessed and been involved in the dramatic development of Hong Kong's history. It is now time for me to take a step back and enjoy the private life with my family."